Additional details have now surfaced in the lawsuit filed by four poker players against the Players Poker Championship tour, the PPC Poker Tour’s two co-owners, and the Maryland Live! casino through which two of the four players won satellite entries to the PPC’s November 2016 Aruba World Championship. 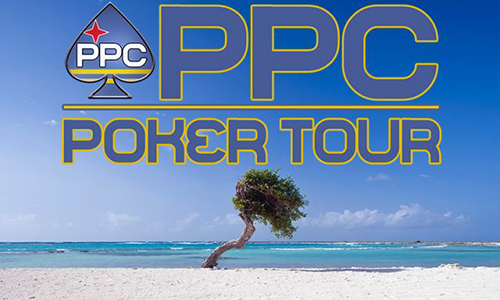 The four players — Stephen Deutsch, Michael Lerner, John Ott, and Joan Sandoval — finished first, fourth, fifth, and sixth, respectively in the PPC Aruba main event. Flushdraw has now obtained several court documents associated with the case, including the proper list of counts brought in the civil case against each of the defendants. Initial reports summed up the allegations as “fraud, misrepresentation, conversion of money/property, negligence, breach of promise, violation of consumer protection act, unjust enrichment, and fraudulent conveyance.” Six separate defendants, either individuals or corporate entities, were named, with additional “John Doe” defendants allowing for room for additional persons or businesses to be added at a later date. Count 1: (Violation of) Racketeer Influenced and Corrupt Organizations [RICO] Act; defendants Players Poker Championship [PPC], Thomas “Sandy” Swartzbaugh (PPC co-owner and tour commissioner), and Bryan P. Oulton (PPC co-owner and tour president). Count 2: Fraud; defendants PPC, Swartzbaugh and Oulton. Count 3: Negligent misrepresentation; defendant PPC only. Count 4: Conversion; defendant PPC only. Count 5: Negligence; defendant PPC only. Count 6: Aiding and abetting negligence; defendants Swartzbaugh and Oulton. Count 7: Aiding and abetting negligence; defendant Maryland Live! casino. Count 8: Promissory estoppel; defendant PPC. Count 9: Aiding and abetting promissory estoppel; defendant Maryland Live! casino. Count 10: Negligent misrepresentation; defendant Maryland Live! casino. Count 11: (Violation of) Maryland Consumer Protection Act; defendants PPC and Maryland Live! casino. Count 12: Unjust enrichment; defendant PPC. Count 13: Fraudulent conveyance; defendants Beachside Consulting, PPC Handling (both are PPC-related business entities), Swartzbaugh, Oulton, and John Does 1-10. The breakdown makes the PPC tour a corporate defendant on eight of the 13 counts. PPC co-owners Swartzbaugh and Oulton are each named on four counts, while Maryland Live! casino, the venue where Deutsch and Lerner qualified for Aruba, is also named in four of the 13 allegations. All four plaintiffs in the action, filed in Maryland by attorney Maurice “Mac” VerStandig, seek to receive both trebled RICO and punitive damages base on the amount of their winnings still owed. Deutsch, the winner of the November 2016 Aruba event, officially cashed for $133,687. Fourth-place finisher Lerner’s official winnings were $48,126, while Ott was supposed to receive $32,085 for fifth, and Sandoval $21,930 for sixth. All four actually received $10,000 in cash while in Aruba, with the remainder of each player’s winning supposed to be wired to his or her bank account within a couple of weeks. The RICO claim allows for trebled damages to be awarded in any “racketeering” case involving multiple defendants or entities, which the case filing claims is fulfilled by the two individuals (Swartzbaugh and Oulton) and the PPC working jointly to defraud the players of the owed winnings. Each of the four players is also asking for as much as $75,000 in punitive damages. Additionally, Deutsch and Lerner, who won their seats at Maryland Live!, were also supposed to win a 2017 PPC Aruba package valued at $5,000. With the PPC’s future now in doubt, the lawsuit asked for that pair of $5,000 gift packages to be included in a judgment as well. The e-mail exchanges between PPC co-owner Swartzbaugh and the four affected players has already been exposed to the public in part, but the case documents offer additional details. as alleged in the lawsuit, the severe financial problems behind the PPC’s facade began to appear in late November. According to the complaint, the players were contacted separately by “one or more agents for PPC” and “an individual purporting to be counsel for a third-party creditor of PPC” — in other words, an as-yet-unnamed financial backer of the tour seeking to get a return on his investment before the players’ winnings were paid. In both cases, the requests to the players were the same — to defer receipt of their winnings and instead receive an ongoing portion of the PPC’s “free cash flow” (should any such financial creature exist), until such time as the winnings were paid in full. It seems obvious that any player who bought in or won into a major poker tourney, then cashed, would expect those winnings to be paid. However, because of the alleged commingling and diversion of funds, plus the “rob Peter to pay Paul” approach, which was described as a classic “Ponzi-style” scheme in the complaint, the money to pay the Aruba winners seemingly never existed or was diverted elsewhere. While the PPC has entered into contractual relationships with many casinos and venues, the lawsuit alleges that Maryland Live! was an active partner with the PPC, doing consdrable promotion of the PPC tour, and thus helping to defraud the affected players. The lawsuit even alleges that an unnamed Maryland Live! employee traveled to Aruba to continue ongoing promotional work with the PPC. That promotional effort even including getting eventual winner to be patched up with a “Maryland Live!” logo for the PPC’s filming of the final table. The complaint offers several additional examples of Maryland Live!’s alleged active involvement with the PPC. Based on a claim made in the complaint itself, early reports stated that the PPC had deleted most of its online content, in addition to co-owners Swartzbaugh and Oulton deleting ther social-media accounts. While the social-media accounts of the two PPC co-owners indeed have been deleted, the same isn’t quite true for the PPC’s online home. Instead, Flushdraw research has determined that the PPC’s hefty load of content has not been deleted, but instead has been de-linked from the domain’s home page and other primary pages. Most if not all of the PPC content once available can still be found online through alternate means.